Catch the Sun: how to get more light in your home? Home is where the heart is. Sure, we often hold contradicted feelings towards it; but if it feels good to leave home, it almost always feels even better to return to it – especially after a long day. Your home is not only your living place – in this case, it is merely called a house; home is the place where you feel comfortable, at ease and safe the most. That being said, one of the key things that can negatively affect your mood indoors and the atmosphere of your sanctuary is the inability to get more light in your home. Getting more light into your home is not only useful in a materialistic manner (i.e. it helps saving energy during daytime), but also it can bring about a sense of tranquility, a serene mood you would almost always need in the morning to get an encouraging beginning of the day that is ahead of you. The first step to resolve any issue or improve any existing situation is, of course, knowing how good or bad the current situation is. Sure enough, each room of your house will be lightened by and exposed to the sunlight at a level that is different than the other rooms. 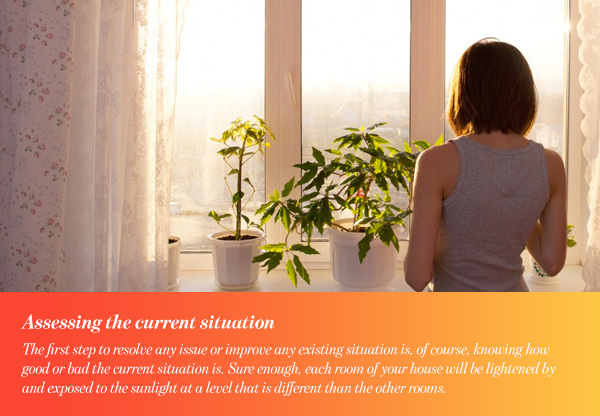 Before taking any actual steps to get more light in your home, take a quick tour to see which rooms have sufficient exposure to the daylight and which rooms does not. This way, you will be able to prioritize the items on your to-do list according to your needs and to the budget you have set for the renovation process. After identifying and prioritizing your needs, you need to check how the floor of your house contributes to the whole process. Are you using dark wooden or ceramic surfaces? 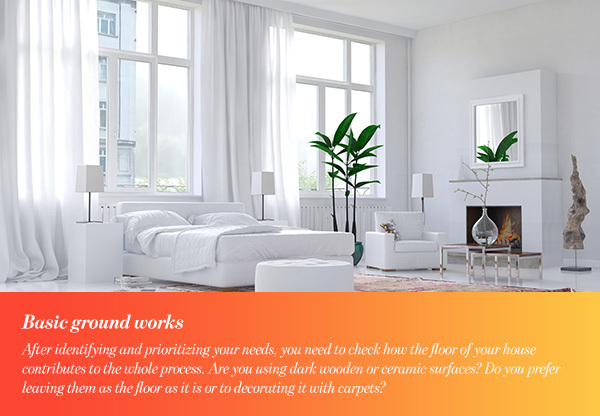 Do you prefer leaving them as the floor as it is or to decorating it with carpets? If you are using surfaces (be it wood, stone or ceramic), make sure they are polished so that they would help reflect the light beams rather than absorbing them. On the other hand, if you prefer carpets, stay away from dark light-absorbing colors and stick to a light-friendly elating palette. No, we do not refer here to the famous Stephen King’s 1980 movie; we mean the literal effect of the shinning surfaces on your house and its brightness. Mirror surfaces are the most obvious example in this case, of course, but they are not the only ones. 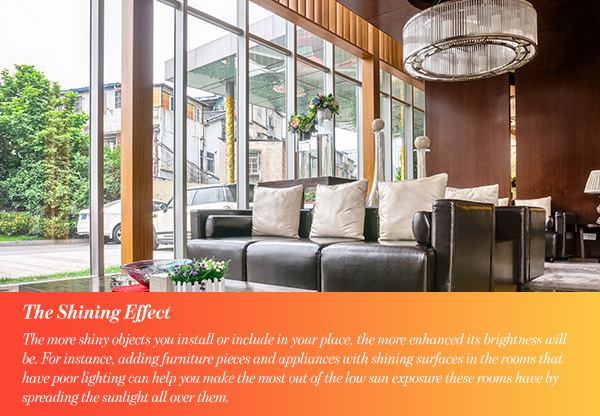 The more shiny objects you install or include in your place, the more enhanced its brightness will be. For instance, adding furniture pieces and appliances with shining surfaces in the rooms that have poor lighting can help you make the most out of the low sun exposure these rooms have by spreading the sunlight all over them. A house garden is an amenity that we all want to have in our houses for many obvious reasons. 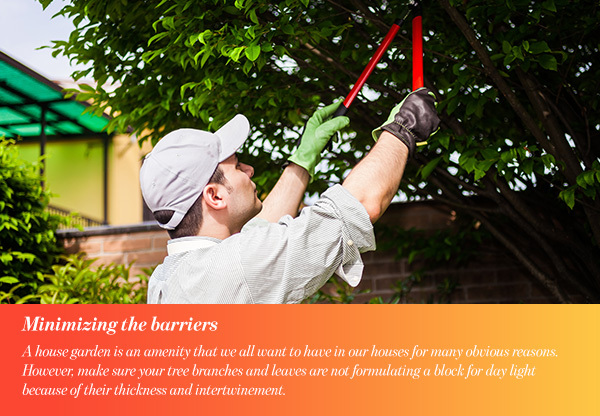 However, make sure your tree branches and leaves are not formulating a block for day light because of their thickness and intertwinement. Every now and then, depending on the number of trees and bushes you have and how fast their branches grow, make sure to trim the plants to let a window for the daylight to come in through. Speaking of windows, quite the contrary of its purpose, glass might sometimes act as a block of sunlight if it’s smudgy or unclean. Make sure to clean and polish your windows to get more light in your home on constant basis. That being said, sunlight coming through the windows can be a hassle during hot summer days. To counter that, install wooden window coverings that you can fold or unfold as you see fit. This might not affect how you can get more light in your home directly, but it certainly affects how much light you keep and make use of. 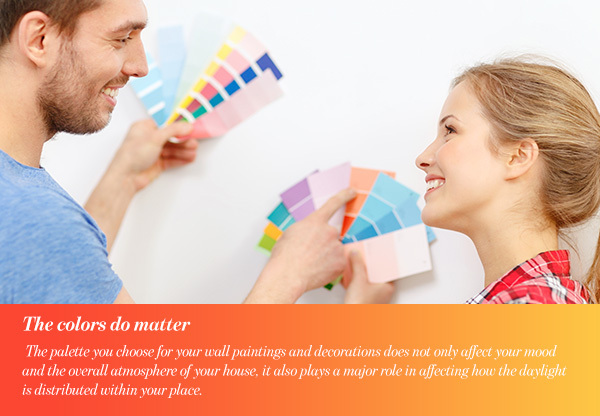 The palette you choose for your wall paintings and decorations does not only affect your mood and the overall atmosphere of your house, it also plays a major role in affecting how the daylight is distributed within your place. As in the case with the work you would need to do with the floor of your house, it is better to choose a palette of light colors for your house components. Light colors can help in reflecting and spreading the light you could let behind your walls rather than just swallowing it as dark colors do. On the other hand, light warm colors can also be helpful in maintaining an overall good optimistic warm mood in your house, so it is a win-win situation. In short, do not underestimate the effect poor or quality brightness can have over your home and yourself. There are many little-yet-effective procedures and steps you can take in order to not only get more light in your home but also to distribute it indoors effectively among all the dark areas. All of this starts, of course, with keeping your house and its components neat, clean and shiny.